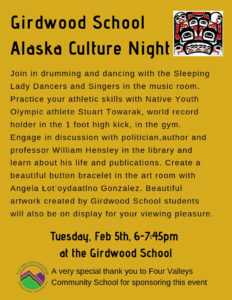 Girdwood K-8 School staff is putting together an Alaska Culture Night on Tuesday February 5th at the Girdwood K-8 School. The idea behind this event is to share and celebrate the rich Alaska Native culture that exists both within and outside of our school. There will be drumming and dancing, an Native Youth Olympic athlete who holds the World Record in the 1 foot high kick, a professor and author sharing a book about his life and publications, and art and crafts to be made and to view. This is a free event that has been coordinated by educators at the Girdwood K-8 School, and proudly sponsored by Four Valleys Community School. Held Tuesday February 5th from 6-7:45p at the Girdwood K-8 School.